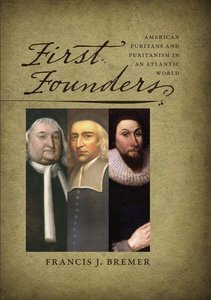 Francis J. Bremer has spent his entire career broadening our understanding of America’s colonial founders. Now, in this eminently readable collection of biographies, Bremer brings us a surprisingly varied and dynamic group of characters who continue to guide and influence America today. With its cast of magistrates, women, clergy, merchants, and Native Americans, First Founders underscores the breadth of early American experience and the profound transatlantic roots of our country’s forebears. Bremer succeeds in bringing little-known figures out of the shadows, while allowing us to appreciate better known figures in an entirely new light. This is a truly fascinating look at the Puritans with keenly drawn portraits and the insight that only a lifetime of scholarship can achieve. It should become the standard introduction to the field. Written in the mold of Joseph Ellis’s Founding Brothers and Gordon Wood’s Revolutionary Characters, the book will appeal to general readers, students, and scholars alike.